Super Turbo Strategy - The Early Game: A winning early game strategy will probably seem at first to be freakishly tight for 10BB stacks. You'll have to get used to folding hands as strong as 99 and AQ from early position. And you may be surprised to learn that you should also be folding AK when a reasonably tight player has raised before you from early position. That's right. You often need to fold AK for 10BBs. Knowing exactly when this is correct is probably best determined with the help of SNG Wizard, but here's an example. Let's roughly define the early game as 9, 8 and 7 handed play. Pretend it's the first hand of the tournament. You are dealt AK in middle or late position, and a player from early position (one of the first three to act) has pushed all-in for 300 chips (10BBs). If this player is pushing the correct range from early position (something like AK+,TT+), he'll be throwing away all the hands that your AK is ahead of! Your best hope is that he also has AK. And even though it's unlikely he has AA or KK (since you hold an A and a K), ICM shows that it's bad for your tournament equity to get all-in against anything that's even slightly ahead of you at this stage (such as any pair vs your AK). Even if this player is pushing a more typical (yet incorrect) range of AT+,66+ you would STILL be better off folding AK. In fact your opponent needs to be pushing somewhere around A9+,A7s+,44+ before you can profitably call with your AK. Pretty amazing, huh? This is why SNG Wizard is essential to developing a good super turbo strategy. If you rely only on common sense to play Super Turbos, you'll probably not be able to beat the $14+$1 level long-term. The good news is most of your opponents will be using only their common sense when they play, and some players seemingly have no sense at all. So you need to be pushing and calling very tightly early, and you should never be raise-folding early. In other words, if you enter the pot just shove all-in. 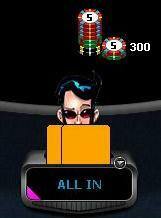 Never raise 3BBs then fold because two other people go all-in. There are a couple exceptions to only shoving when you enter a pot. One play that is very profitable is limping with AA or KK.